In 1934, when Smith, Kline and French began selling amphetamine as an inhaler under the trade name Benzedrine as a decongestant. “One of the fundamental drugs in medicine,” SKF’s advertising declared, with physicians and the public inclined to agree. Benzedrine Sulphate the 1st prescription drug for treating “discouragement” – was on the way to medical stardom. As early as 1919, Akira Ogata synthesized methamphetamine via reduction of ephedrine using red phosphorus and iodine. Later, the chemists Hauschild and Dobke from the German pharmaceutical company Temmler developed an easier method for converting ephedrine to methamphetamine. As a result, it was possible for Temmler to market it on a large scale as a non-prescription drug under the trade name Pervitin (methamphetamine hydrochloride). During WW2, amphetamine and methamphetamine were used extensively by both the Allied and Axis forces for their stimulant and performance-enhancing effects. Pervitin was commonly used by the German and Finnish militaries. It was widely distributed across German military ranks and divisions, from elite forces to tank crews and aircraft personnel, with many millions of tablets being distributed throughout the war for its performance enhancing stimulant effects and to induce extended wakefulness. Its use by German Tank (Panzer) crews also led to it being known as Panzerschokolade (“Tank-Chocolates”). It was also colloquially known among German Luftwaffe pilots as Stuka-Tabletten (“Stuka-Tablets”) and Hermann-Göring-Pillen (“Herman-Göring-Pills”). More than 35 million 3-milligram doses of Pervitin were manufactured for the German army and Air Force between April and July 1940. From 1942 until his death in 1945, Adolf Hitler was given intravenous injections of methamphetamine by his personal physician Theodor Morell. As with the rest of the world at the time, the side effects of methamphetamine were not well studied, and regulation was not deemed necessary. In the 1940s and 1950s, the drug was widely administered to Japanese Industrial Workers to increase their productivity. British troops used 72 million amphetamine tablets in the 2nd world war. The RAF used so many that “Methedrine won the Battle of Britain” according to 1 report. Misuse of methamphetamine may cause sudden death and serious cardiovascular adverse effects. Up, down, flying around, looping the loop and defying the ground……………….. The 2 gunners were the ones most likely to doze off because of their long periods of inactivity. Doing a visual search on a pitch black night kind of hypnotized and, along with the drone of the engines, induced sleep in most normal gunners. Most were too damned scared to close their eyes. In fact they stared into the darkness so hard that some couldn’t close their eyes for a least 4 hours after landing. Eyelids were thought to be stuck under the edge of their helmets. All were advised, that they could have ‘wakey-wakey’ tablets if we felt we needed them, but were also advised not to take them if we did not need them. They were caffeine tablets and also acted as a diuretic. You know what that meant and nobody enjoyed that parade at 20,000 feet and minus 40⁰! The Benzedrine some people mentioned was in the form of tablets in our escape kits and to be used ONLY in the utmost urgency, as running from pursuers to cover lots of ground. Our Medics advised us if we used them and did push ourselves to the limit to escape, we were to realize that we would be completely worn out and to make sure to find some place where we could sleep the clock around. ‘Wakey-wakey’ pills were issued to bomber crews, and were often hoarded for their all too infrequent spells of leave! Caffeine is also effective at reversing some of the effects of fatigue. It compares favourably to amphetamine in improving cognitive performance but is less effective in maintaining alertness. Based purely on efficacy, it is a 2nd choice to amphetamine. Due to its low abuse potential and wide availability, however, caffeine still offers significant utility (especially in ground personnel). “In a great many instances the difference between sleepiness and alertness is the difference between life and death. A man who dozes off in a jungle foxhole may never wake up again. “It is therefore understandable, in light of the unprecedented human exertion required by modern warfare, that military commanders sought a solution to the problem of combat fatigue. The military looked to psychiatry for a solution; they found an answer in amphetamine. Benzedrine’s ability to “relieve feelings of dullness and inadequacy” made it susceptible to abuse. Instead, the instructions recommended Benzedrine for the Infantry when exhausted troops were required to engage in work or combat, and to transport drivers and dispatch riders who needed to overcome the dangerous effect of “monotony, lighting, and other conditions of driviing. However, much like the public’s discovery of Benzedrine’s mood-altering properties, Military Commanders were aware of Benzedrine’s ability to increase confidence, aggression and ‘morale’ among soldiers. Amphetamine was given to Allied Bomber Pilots during WW2 to sustain them by fighting off fatigue and enhancing focus during long flights. The greatest experiment in amphetamine-based enhancement. In 1939 the Blitzkrieg’s success was attributed partly to the use of Pervitin – methamphetamine – among German soldiers. By mid-1940 the British and American militaries had begun their own respective chemical investigations. Both eventually settled on Benzedrine to combat fatigue and boost morale. The drug proved especially popular among pilots and air crews, who often had to fly long, gruelling bombing raids late into the night. By 1943 a package of Benzedrine pills had its place in the emergency kit of every American bomber. Two years later a survey of European fighter pilots who frequently flew long missions showed that around 15% frequently used Benzedrine. Methamphetamine produced similar results; ironically, the accompanying recklessness, along with worries about addiction, quickly led the Germans to discourage its use in the field. American and British forces, however, used amphetamine throughout the war for its effects on mood and morale: it kept up the “fighting spirit.” The British later concluded the subjective boost wasn’t worth the potentially lethal side effects. World War II did little to hurt the appetite for amphetamine. In fact, the increased exposure on the battlefield likely helped, and by 1945 SKF produced a million Benzedrine tablets a day. 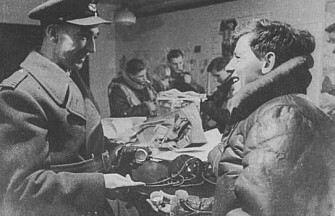 Roland Winfield of the Royal Air Force was studying the effects of Benzedrine on long-range Bomber Command missions when the bomber pilot he was observing suddenly plunged his aircraft below the cover of clouds, into heavy anti-aircraft fire, in order to “press home the attack.” The pilot scored a direct hit. Winfield recommended Benzedrine for every RAF mission, for the “determination” and “aggression” that it imparted. By early 1942, Smith, Kline and French was supplying large quantities of Benzedrine to the RAF. Likewise, a British war memorandum in 1943 titled A Guide to the Preservation of Life at Sea after Shipwreck suggested that shipwrecked sailors use Benzedrine to “lessen feelings of fatigue and exhaustion, promote alertness, raise the spirits, and prolong the will to ‘hang on and live’.” That same year the Army Supply Service provided commanders with packets of 6 Benzedrine ‘pep pills’ for each of their soldiers. U.S. marines relied on Benzedrine during the invasion of Tarawa in November 1943, and paratroopers used the stimulant during the rigorous D-Day landings in June 1944. Certainly Sir Stirling Moss admitted that the ‘wakey-wakey’ pills he was issued on the 1955 Mille Miglia worked particularly well. He drove the entire 1000 miles non-stop, took part in the Awards Party, then he drove from Italy to Stuttgart for a celebration dinner with the Mercedes Benz management, before eventually deciding he needed a night’s sleep! During the Persian Gulf War, amphetamine became the drug of choice for American bomber pilots, being used on a voluntary basis by roughly half of U.S. Air Force pilots. The Tarnak Farm incident, in which an American F-16 pilot killed several friendly Canadian soldiers on the ground, was blamed by the pilot on his use of amphetamine. Slang terms for methamphetamine, especially common among illicit users, are numerous and vary from region to region. Some names are wakey wakey pills, pep pills, bennies, crystal meth, meth, speed, crystal, ice, shards, glass, jib, crank, tweak, rock, tina, fast, and cold. Terms vary by region and subculture. Eventually, as the addictive properties of the drugs became known, governments began to place strict controls on the sale of the drugs. For example, during the early 1970s in the United States, amphetamine became a schedule II controlled substance under the Controlled Substances Act. Despite strict government controls, both amphetamine and methamphetamine have still been used legally or illicitly by individuals from a variety of backgrounds for different purposes. It was not until 1986 that Pervitin became a controlled substance, requiring a special prescription to obtain.